1. PRWeek can reveal exclusive pictures from the Duke and Duchess of Cambridge's first weekend as a married couple in the UK. 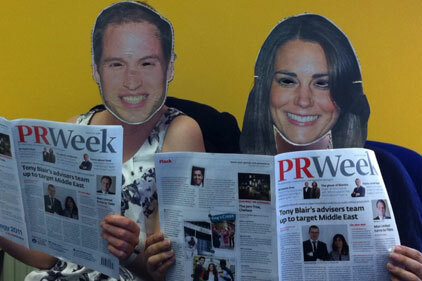 Apparently the royal pair turned up at Pelican PR's offices, keen for their latest fix of our esteemed organ. More interestingly, it appears Wills likes to wear dresses. Flack doubts his cost £250k though. 2. Hats (and fascinators) off to PR agency WixHill, which secured coverage for St Ermin's hotel, close to Westminster Abbey. The agency teamed up with London & Partners to create a royal wedding media centre. More than 100 hungry hacks turned up to devour oysters and champagne, including the Daily Mirror's ecstatic Steve Myall. 3. Threepipe's co-founder Jim Hawker has been immortalised on his own collectable football sticker, courtesy of his client Match Attax. He is pictured holding the Premier League cup with Fulham Club colours in the background. It's good to dream, Jim.